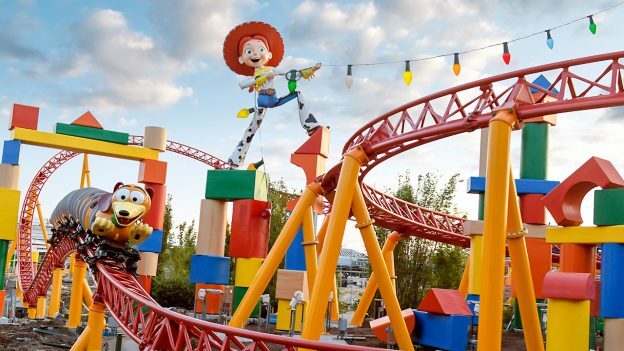 Fastpass+ reservations are now open for those of you wanting to play with your favorite toys in Toy Story Land at Disney’s Hollywood Studios, if you are staying at select Walt Disney World Resort hotels! Starting today, FastPass+ reservations are available all attractions in the land. Guests who are at 60 days from the start of their Walt Disney World Resort hotel check-in are able to choose one FastPass+ reservation for one of the Toy Story Land attractions, in addition to two other attractions in the park (such as Rock ‘n’ Rollercoaster or The Twilight Zone Tower of Terror), depending on availability. We told you about the tiered system applying to Toy Story Land two weeks ago. Also, beginning July 1, Disney’s Hollywood Studios will also operate from 8 a.m. – 10:30 p.m. for a limited time. Additionally, more Extra Magic Hours opportunities will be available. This includes daily morning Extra Magic Hours, plus evening Extra Magic Hours that will be offered once per week.